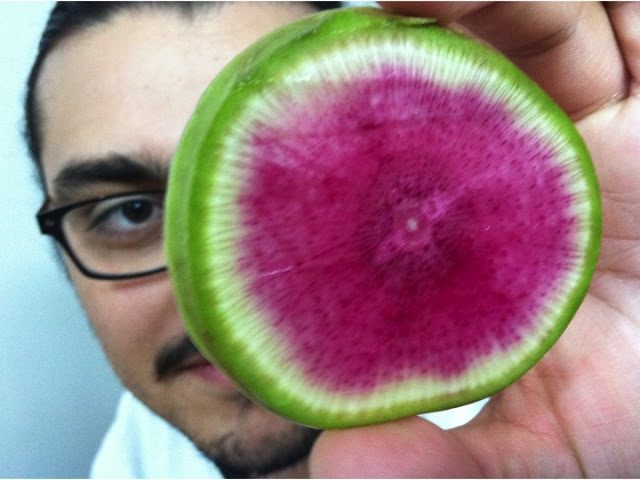 It’s a beautiful thing, the watermelon radish. Gorgeous with a classic bite. 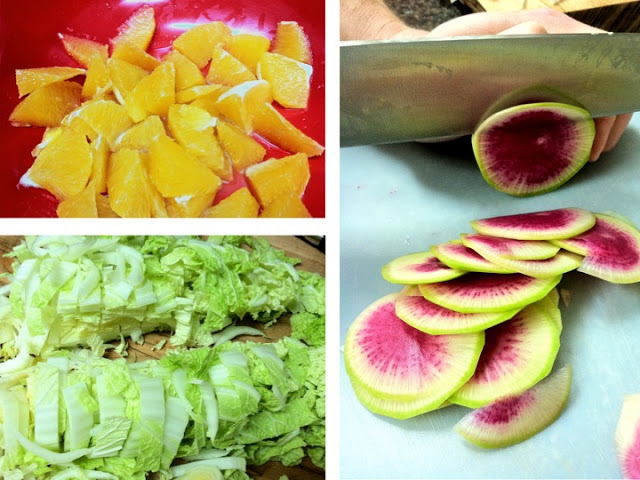 Thank you Lucy and Chaw, our farmers, for introducing gems like the watermelon radish. Slightly bigger than you’re typical bright, red radish; this one’s like a turnip. And more playful. Adds a fantastically spiced crunch to any salad, or works as a pleasing garnish – or both! The citrus recipe was inspired by a fellow CSA-mate and reader. Thank you. Balsamic vinegar - 2 tsp. Olive oil - 1 tbs. Sea salt - 1 tsp. Slice the cabbage and add to a big bowl. Prepare the oranges as you would in Amma's Christmas Fruit Salad. Peel the orange first. Peel the sheer white casing from each slice, so you remain with a slice of pure pulp in tact. Cut each slice in half. Squeeze out the juice from all the remaining parts of the orange. Add the orange slices to the bowl. Bring a pot of water to a boil for blanching the spinach. This means flash cooking it to soften the fibers and bring the color to a bright green (also the way to prepare for freezing). Prepare a bowl of ice cold water on the counterop. Meanwhile, rinse the spinach in a colander. When the water is boiling add the spinach for 30 seconds or until bright green. Use a slotted spoon to transfer the spinach into the cold water. This will stop the cooking immediately. Save the spinach water for the quinoa! Drain the spinach in a colander and squeeze with your hands to remove excess water. Add to the growing bowl of goodies, separating the squeezed mass with your hands. 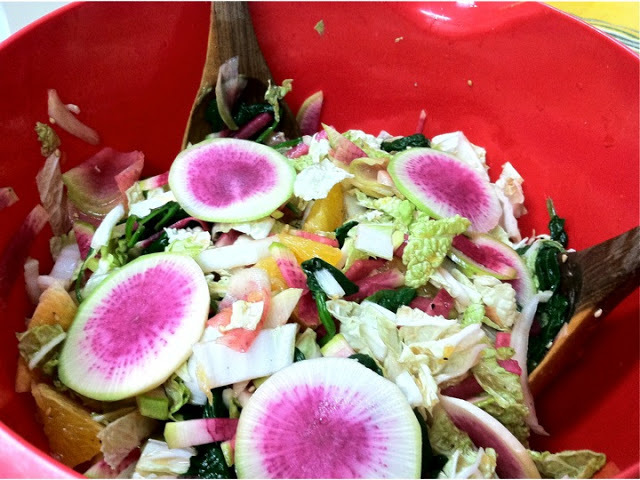 Peel the watermelon radishes and slice very thinly into circles, and then into halves. Use a mandoline if you have one. (Set aside a few full circles for garnishing.) Add to the bowl. In a small skillet, toast the sesame seeds over medium heat. Shake the pan every 30 seconds to evenly toast.Watch carefully or they will burn when you turn your back! When the seeds begin to pop, take them off and add to the bowl. For the dressing, whisk all ingredients together and add to bowl. 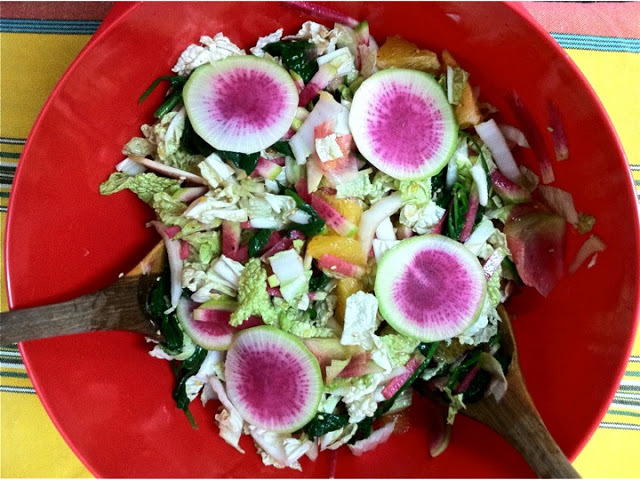 Mix everything together and garnish with watermelon radish slices. Place in the fridge while you prepare the quinoa. 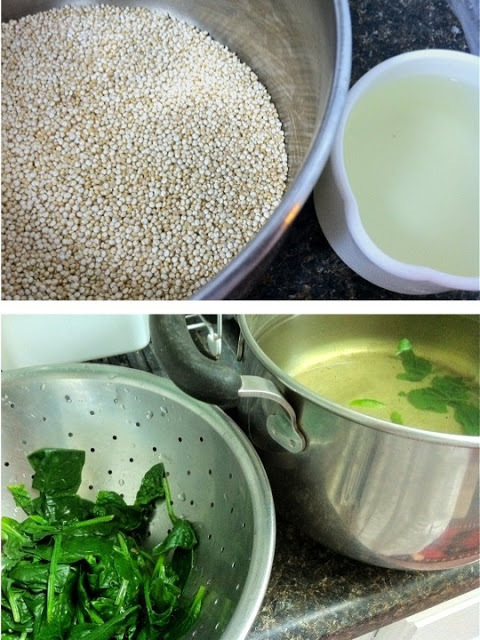 In a small pot, add the quinoa and spinach water and bring to a boil. When boiling, turn down to simmer and cook covered for about 20 minutes, or until quinoa has fully absorbed the water. Meanwhile, toast the sunflower seeds and almonds in a dry skillet until golden. Pay attention. 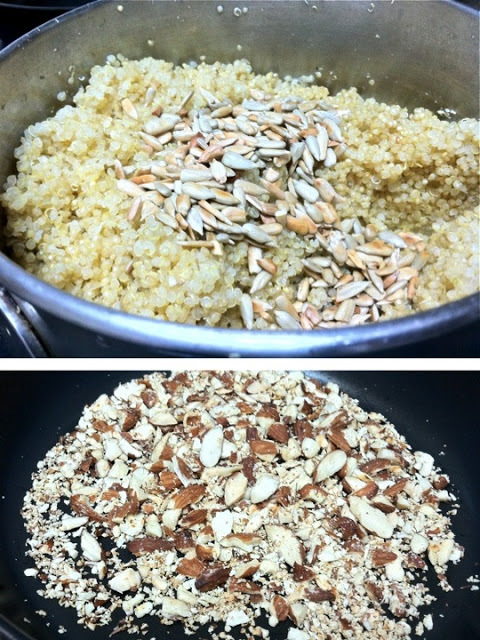 When the quinoa is done, transfer to a bowl and mix in the seeds, nuts, squash oil, and sea salt. This oil is marvelous! Truly unique, nutty, squashy, and flavorful (a Christmas gift from my sweetheart). Add more salt if needed. 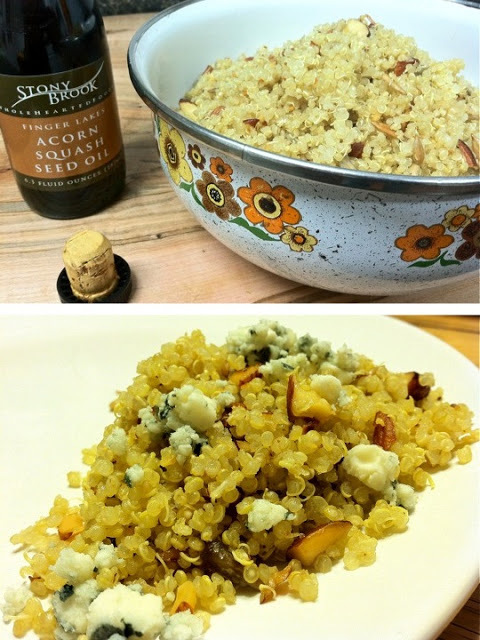 Sprinkle gorgonzola on top when serving. A sprinkle of freshly ground pepper will also do.